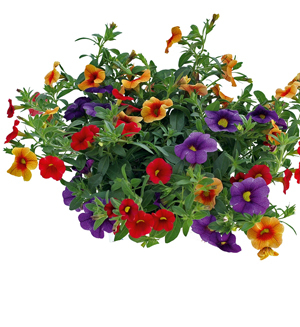 Our ‘Hawaiian Luau’ Combination is a bright, totally tropical combination of three vividly colored Aloha Series calibrachoa, all of which have exceptional branching and larger-than-average blossoms, making them exceptionally popular. Red, purple and orange are the most prominent luau colors! The plants in our 'Hawaiian Luau' plants are grown and shipped in fine quality growing medium and are guaranteed to arrive alive and ready to thrive. Comment: It was packaged and shipped so well. I had searched for this plant and could not find it locally. I love it and the hummingbirds love it! "cant say enough good things"
Comment: Great combinations and other flower here at GrowJoy!!!!!!!!!!! !